In 2014 we published the book Our Awesome God! Our Amazing Adventure! 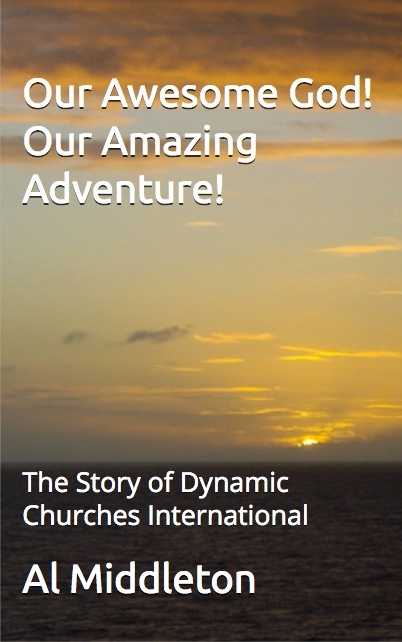 This full length book by Al Middleton tells the story of his spiritual journey and of DCI’s birth, mission and international development. The book is now is available as a Kindle ebook on Amazon.com. The subtitle of the book is Living Out His Eternal Life Within! This volume is not only a testimony and “chapter” of missions history, it is a practical discipleship resource that can encourage and equip you to be more involved in the Great Commission. Over the forty years that I have been in ministry, I have talked with many people, who are discouraged, disappointed even disillusioned with their lives. I have also met others who seem to live in an endless stream of vibrant and fulfilling adventures. Although many claim to be Christians, it is obvious that not all of them have discovered how to live in the fullness of what God has provided for each of us through the resurrection life of Jesus Christ. Satan is a great liar and deceiver. He will do all he can to convince you that you are useless and that you could never accomplish anything great or bring glory to God. The difference between Truth and Lies is that truth has substance. Truth has power! It can be substantiated by facts. Lies have no substance. Lies have no power. They say that if you hear a lie often enough you will begin to believe it as truth. When we accept a lie as truth, we attribute power to it. Lies can be very powerful, but only if we choose to believe them. Many Christians believe Satan’s lies about them and are living frustrated and fruitless lives. I acknowledge that I have not always lived in the fullness of the abundant, supernatural life God has called me to live, but I am learning and I have seen God work in me and through me. As I share what God has done and continues to do in my life, often people express their amazement. Perhaps it is because they know me personally and know how very ordinary I am. I too am amazed that God would choose me for such an adventure. I am learning that God can use the least likely person (and often does) if he or she will be an empty vessel through which He can do His mighty work. I have developed a personal philosophy for my life. I understand myself well enough to know that if I thought I could get away with taking any of the credit, I would. But if I try to brag that I have done that which God has obviously accomplished, then you would mock me. No one enjoys being mocked! Success in God’s eyes is when we humbly and faithfully do what He has given us to do.